Whatever you enjoy, whether it's going for long walks, dipping into the sea, spending time with the family or eating out, North Devon's a great place to come on holiday. With beautiful, safe, sandy beaches perfect for rockpooling, swimming, surfing and lazing around, rugged coastlines, mysterious moors and rolling green hills, this area is certainly one of contrasts - and most people find something here that makes them not want to leave. And being slightly off the beaten track, North Devon manages to avoid much of the commercialisation of South Devon, yet is still well prepared for visitors, offering great attractions, delicious local food and drink and plenty to do. 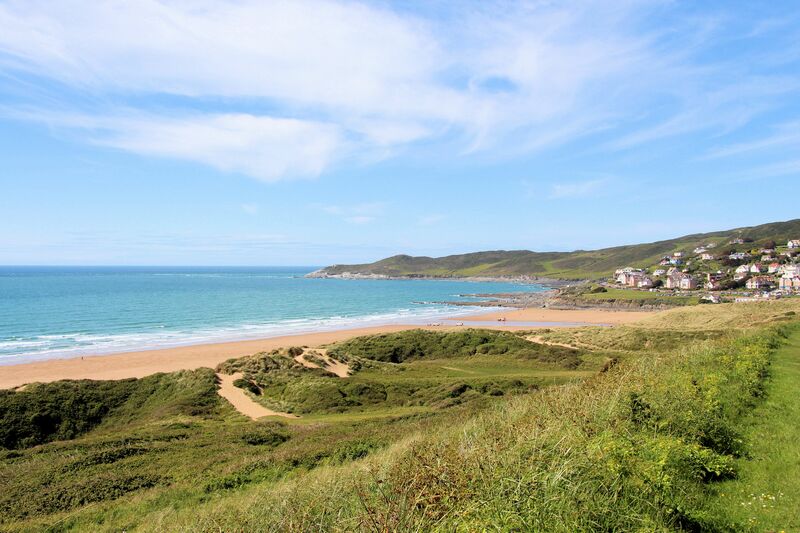 Woolacombe's miles of golden sand, and Croyde's great surfing beach and pretty cottages means that this area is world-famous. 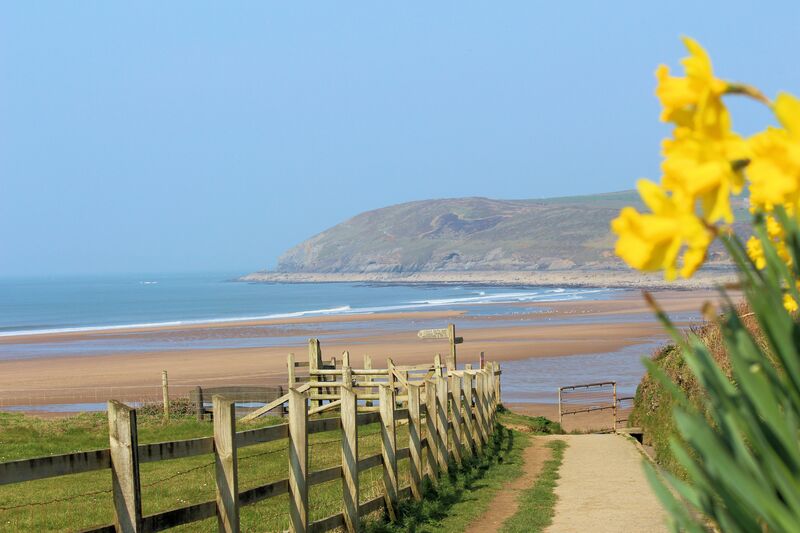 Woolacombe village is known for being particularly family-friendly, and has a good offering of shops, ice cream parlours, amusements and places to eat, whilst Croyde also has a smattering of places to eat and shop plus a laid-back, surfy atmosphere. Also nearby are the historic and quaint village of Georgeham, the nice beach and café at Putsborough beach Putsborough, the large and friendly waterside village of Braunton, and breathtaking Saunton Sands, which has been used as a location for many films, video and television productions. The Victorian seaside town of Ilfracombe is full of curiosities old and new. You'll find grand Victorian hotels and the old working harbour alongside Damien Hirst's enormous (and controversial) bronze statue Vertity, and galleries with further examples of his work. Ilfracombe is a bit of a cultural hub, but also popular with children and nature lovers too, thanks to its great rockpools and crabbing spots, pretty nearby coves and lovely walks. Combe Martin and its neighbour Berrynarbour attract visitors for their natural beauty. Sitting right at the very edge of Exmoor, surrounded by amazing coastal views, medieval field patterns, the pretty cottages inspired some of Beatrix Potter's books. Exmoor National Park is one of Britain's hidden treasures, with its dramatic coast and countryside and full of new places to discover. Visit Dulverton, the setting of part of Blackmore's classic novel 'Lorna Doone'; Porlock, a coastal village and port with stunning views; or the charming twin towns of Lynton and Lynmouth (known as 'Little Switzerland'), which are joined by a water powered cliff railway which effortlessly takes you up a 500 foot cliff. Barnstaple, the regional centre of North Devon, is the place to head to in North Devon if you want to spend the day hitting the shops. It's got lots of High Street favourites, but a great selection of independent shops too (try Butcher's Row for foodie finds, and the Pannier Market for both food and crafts). Barnstaple is also home to the North Devon Leisure Centre which provides swimming and other indoor sports, The Queens Theatre, a four screen cinema, and Barnstaple Museum, which is well worth a visit. Bideford, Westward Ho!, Instow and Appledore: browsing, strolling - and adrenaline sports! Sitting alongside the river Torridge, the second of the two huge rivers that have carved this part of the coast into such a beautiful and interesting area, is historic Bideford. Known as the 'little white town', it has a nice collections of shops, pubs, restaurants and attractions and an attractive quay to stroll along. Family-friendly Westward Ho! is fronted by a 2 mile long sandy beach, backed by traditional bucket and spade shops, tea rooms and restaurants, and is a popular beach for watersports. At the mouth of the Torridge sits pretty Appledore, a quaint village with a number of galleries, crafts shops and regular art festivals, and across the water is upmarket Instow, which has a yacht club, nice places to eat, sand dunes to explore, and a small dog-friendly beach. On the western tip of North Devon you'll find Hartland with some of the most stunning coastal scenery in Britain, and then further along the coast is historic Clovelly: untouched for centuries, its cobbled streets and thatched cottages tumble down the cliff to a 14th century fishing harbour. The area right in the heart of North Devon are known as Ruby Country and Tarka Country, which inspired Henry Williamson's novel, Tarka the Otter. Great Torrington has a huge amount of history, having played an important role in the Civil War, whilst traditional Holsworthy in the heart of Ruby Country boasts one of the busiest and largest livestock and pannier markets in the country. And the historic market town of Hatherleigh, with its thatch and cob cottages, is the perfect place to experience rural Devon life.